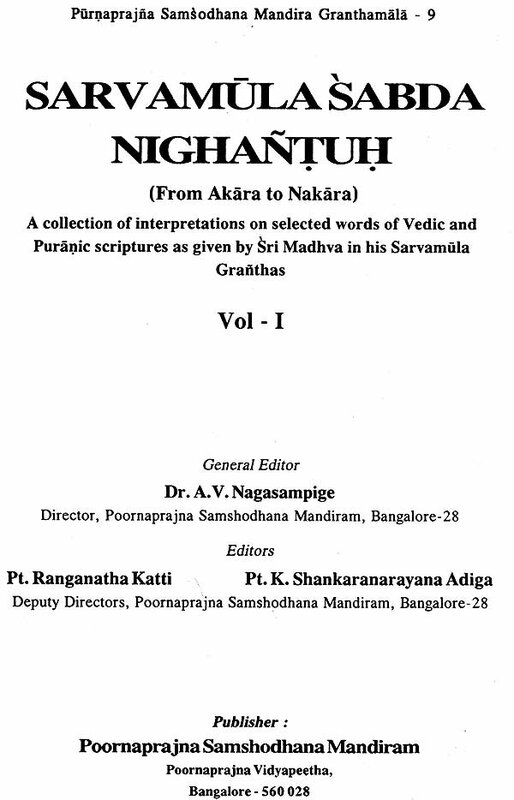 The "Sarvamoolashabda Nighantu" is a scholarly and comprehensive work that fulfills a great need for the serious student studying the Philosophy of Tatvavada of Acharya Madhva. 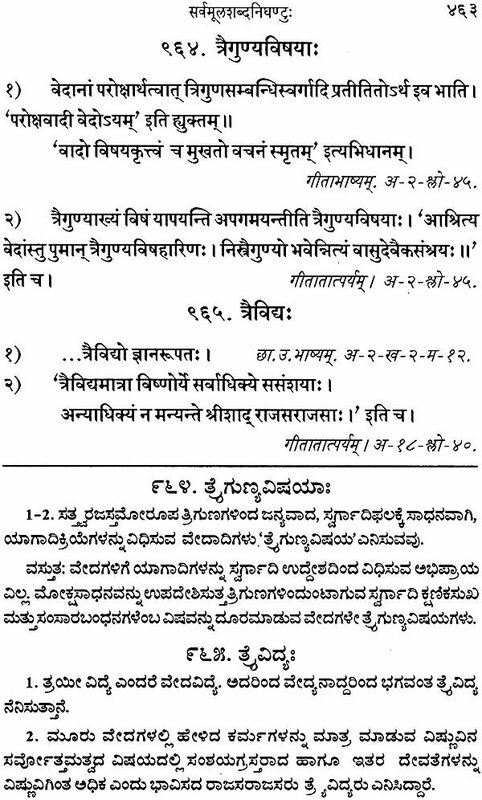 As is well known, Madhva has authored 37 authoritative works on diverse subjects covering a wide range of primary source material such as the Brahma suthras, Geetha, Mahabharatha and Bhagavatha as well as the Upanishads with more than one work on the same subject in some cases, such as the Brahma suthras to achieve complete coverage and clarity. These are listed by Sri Vishvapathi Tirtha in his commentary of Srimadhvavijaya, the biography of Acharya Madhva. A list of these compositions commonly referred to as Sarvamoola is given at the end of this Introduction separately. 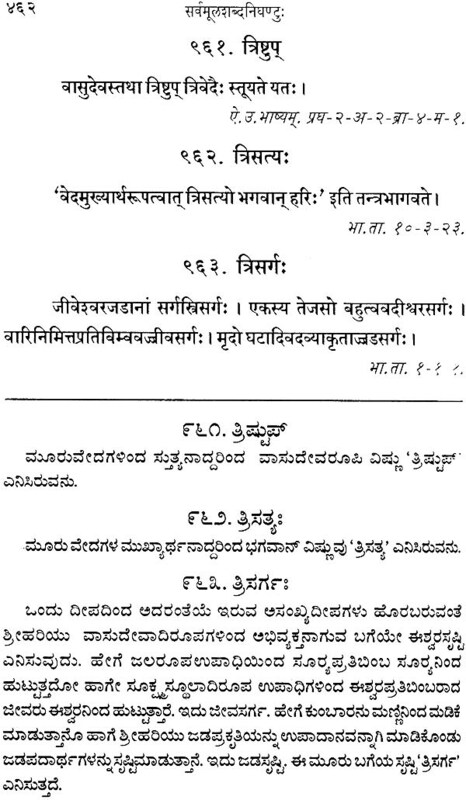 Recently, a few more small compositions have also been ascribed to Madhva - Tithinirnaya, Kandukasthuthi, Sannyasa paddhathi, Bilvamangalah sadhuh a shloka. 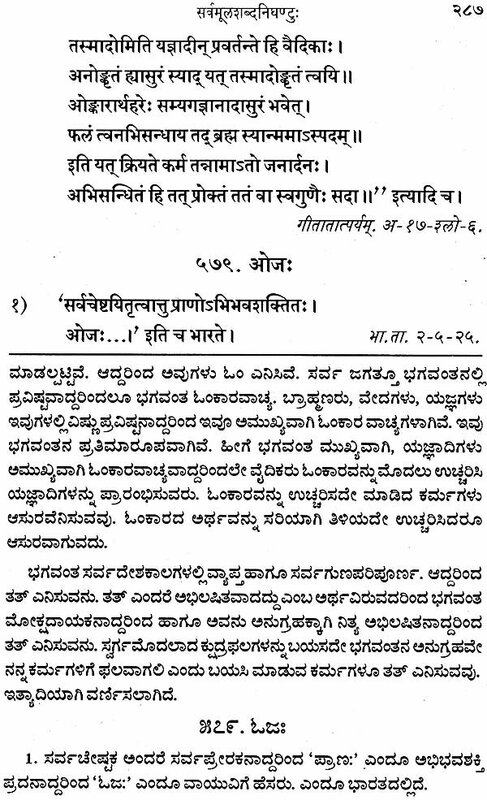 Even Sri Narayana pandithacharya, the author of Sri Madhvavijaya seems to indicate that there were more compositions by Madhva of the nature of Subhashitha, Sthothra, Gatha etc. and compares them to the uncounted numbers of jewels from the Ocean, the abode of such gems. Study of these compositions in depth therefore requires a close understanding of Etymology of the words used therein. This becomes all the more important as, in the words of Dr. B.N.K. Sharma, the doyen of Tatvavada writers, "Madhva's writings are characterised by extreme brevity of expression and compression of thought" - (Note in his book on Philosophy of Sri Madhvacharya). Chamber's English Dictionary defines "Etymology" as Tracing, Account of, Formation of words, Origin, Development of words - their science. 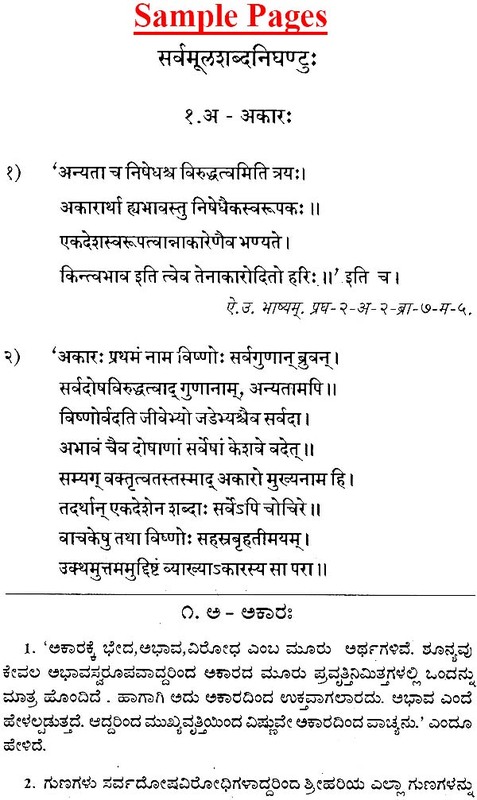 Unlike modern languages like English, where words connote commonly accepted meanings based on usage, which may change in course of time, Sanskrit has very rigid Niruktha and Vyakarana Shasthras, which prescribes fixed meanings to words and their roots, which is not allowed to drift or change in time. For the Shasthras dealing with eternal truths and philosophical speculation, precision of language and its close adherence with expressed thoughts over long periods of time to correspond with the original sources is extremely important for any serious analysis and discussions on competing systems, which originate in different periods of time and grow and develop at different rates due to voluminous work put in by successors coming up at later periods, Further, we have the eternal and timeless Vedas using the ancient sanskrit language, along with many hoary compositions like the Mahabharatha, Bhagavadgeetha, Ramayana, Bhagavatha and the eighteen Puranas, the Brahma Suthras etc all of which need correct interpretation of the meanings by adhering to the prescribed rules, as per the original sources, for deriving a cogent and consistent philosophical system. The original texts themselves are rich in metaphor, figurative and a allegorical language, imagery, figurative illustrations of mental states, which are highly subjective and not easily described ill words, and deal with extremely esoteric and complex issues like the Soul, the Supreme Being etc. Therefore, a study of the meanings of words used by Acharya Madhva in his compositions, is vital to a proper understanding of his philosophy. The method of dialectical disputations between rival systems to arrive at the final Siddhantha position adopted by almost all, also require a close agreement between the meanings and the usage of words. A close study of Madhva's works also reveals a mastery over the Sanskrit language - not only of Panini, but also the Vedic Sanskrit of the timeless Vedas along with familiarity and access to many compositions, which are not available today. Thus, study of the Nighantu will not only help in understanding Madhva himself, but will also enable a greater insight into the Sanskrit language itself ..
1. In addition to the terseness and economy of words, Madhva repeatedly uses well crafted expressions which deal with many aspects of discussions by differing interpretations of the same few words, some times with the compound words being split in different ways. As many as 8 to 10 Purvapakshas are referred to and effectively answered by one statement in some cases. This aspect is referred to by himself - when he says of the Suthra Bhashya - Granthoyamapi bhahvartho, bhashyam chathyarthavistharam. Sri Madhvavijaya describes the Anubhshya as giving Anantharthah prakatitah - expressing infinite meanings. Obviously one has to tread very carefully in discovering the myriad meanings intended/built into the composition by the divine author. Fortunately the voluminous and detailed commentaries by Sri Teekacharya and other Madhva luminaries light the path of interpretation for us very effectively. 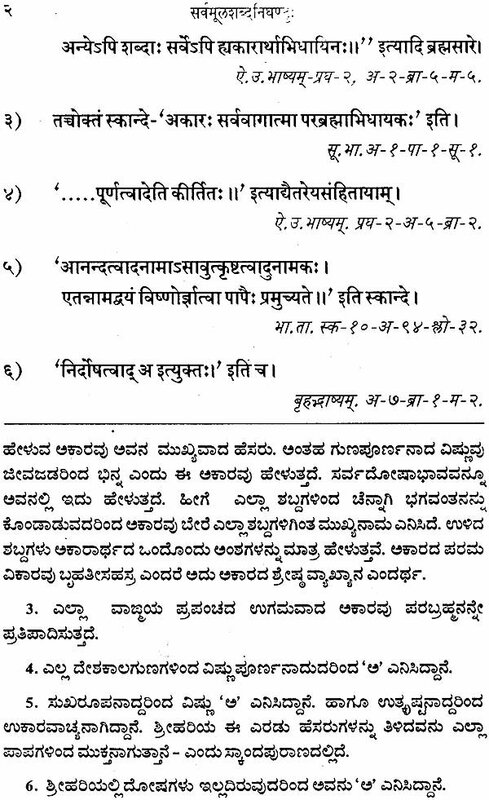 Madhva's extraordinary reference systems - quoting widely from the Puranas, Panchrathra texts, and many ancient voluminous compositions which are known only as names today help in determining appropriate meanings for many words and expressions in the original compositions based on the context, subject under discussion and other authorities on the issues. His interpretations of words like Prapancha, Advaita etc when dealing with Upanishads are not only based on sound grammar and canons of Nirukthi, but also on the avoidance of errors of interpretation such as repetition of ideas, inconsistency with past statements or future declarations, irrelevance etc. Madhva himself indicates his reasoning for a particular interpretation briefly, usually explained adequately by his commentators. 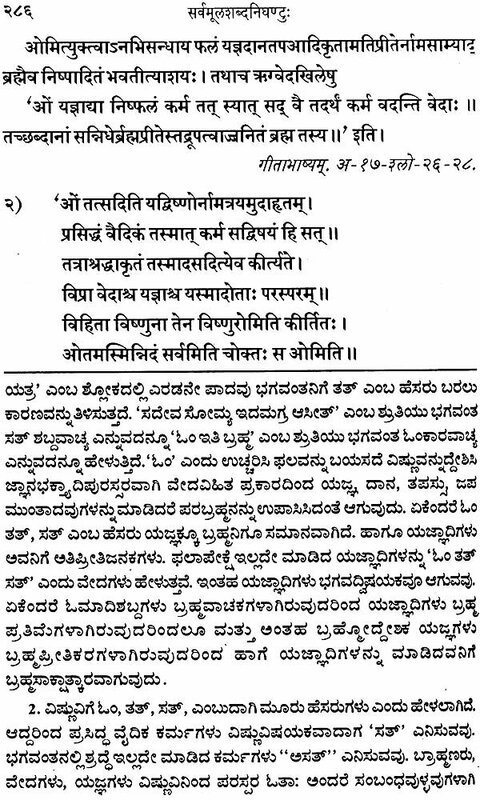 There is another unique aspect of Madhva compositions, which is very scarcely found in other systems - total consistency of thought and homogeneity of the total system without internal contradictions, resting on firm foundations of well understood Pramanas - Prathyaksha, Agama and Anumana, each with its own place of primacy and validity and interrelationships. There is no excessive emphasis on the one or the other, leading to denial of the reality of the world itself, its joys and sufferings and in the ultimate analysis, the eternal and unrestricted supremacy and independence of the Supreme Being Himself. 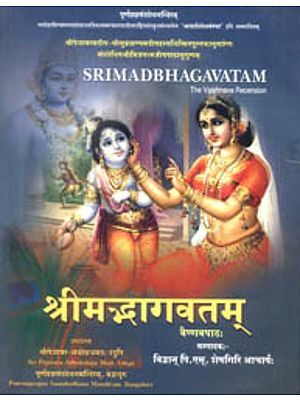 The classification of all Shasthra compositions as Sadagama and Otherwise based on the matchless and perfect Vedas with no defects in them, being the touchstone for validity used by Acharya Madhva avoids relegating huge masses of the Vedas, Upanishads, Puranas etc as invalid, repetitive etc. as other philosophers have done. This makes Madhva's task of achieving consistency and homogeneity harder as he has to show that his system is validated by All Sadagamas. But in the process, Madhva's own commentaries explaining the crucial texts achieve pinnacles of perfection in Grammar, syntax, Etymology etc and leave one convinced that here is the master leading us along the path of knowledge into the realms of Divine Grace.